Danielle continues to tear through every major release thrown her way, Spaff disappears into a brutal world of trial-by-drum-and-bass, Chris wishes he would suddenly lose control of parts of his body at random in group situations, and Jake thinks he has played a video game once in his life, but is mistaken. Also, the Firearms mod for the original Half-Life (which was apparently based on a Quake mod of the same name) had a system where you could break one or both of your legs from falling too far, in addition to various other status ailments like bleeding out. There was no way to fix any of these, besides investing in a "medic" skill tree that everyone ignored in favor of skill trees that increased their reload speed or reduced weapon sway. When my friend and I figured this out, we had some of the best online FPS time of our lives running around public servers healing people, many of whom had never seen the "medic" skill tree in action and hence were surprisingly upset or confused at the prospect of being healed without their consent. I got shot more than a couple times while doing it, and another time there was this one hilarious guy who had broken his leg and was slowly bleeding out. If you hit the "medic" hotkey when you weren't in range of a player model, this mock-gruff VA would bellow, "Stop and I'll treat you!" Even though I could always catch up with the guy, he still kept crawling away from me, interrupting the "medic" animation at just the last second, leaving me to bark "Stop and I'll treat you!" several more times as I pursued him ten more feet to his new resting place. I was in tears with laughter by the end. The line plays about thirteen seconds in. The guitar guy from Mad Max is the Coma-Doof Warrior. "Doof doof" is Australian slang for heavily bass driven electronic music. Danielle, PLEASE do Farscape Rewatch. I would love that so very much. Danielle should do an entire episode as indignant 14 year-old Danielle. "I KNOW WHAT THEY LOOK LIKE!" Made me laugh pretty hard. In Smash Bros Brawl there is tripping, where a player will randomly fall over when they try to run or dash or whatever (1% of the time according to some smash wiki). I'm pretty sure all THE MLG pro dudes hated it. Seriously though, i get burnt out on games when they're announced too early to the point where i'm bored of the game before i even get my hands on it. Don't all three of those sound the same? "woof" should rhyme with "hoof"? Sometimes I see that a game was released this week and do a double take -- hasn't that been out for a while? I thought I played it and got bored of it. This must be the Game of the Year edition or someth--no... original release... guess I just read a lot about it! That's not really different from me thinking, "I got everything about that movie from the trailers and feel oversaturated from the press blitz" with movies, either. The half life on playstation discussion reminded me of the part of God of War 3 where you watch from the eyes of some god while Kratos beats them. Its an odd moment of punching yourself in the face. I can't remember who brought it up but the new Unreal Tournament is in a pre-alpha stage, however anyone can download and play it. Also looks like they are keeping some of the silliness and are trying to ditch the dark FPS aesthetic that has ruled recent FPS games including UT3. Part of this may be because of the way this game is being developed by the community and the developers at the same time. I doubt the Bombing Run game mode would be included if Epic was making UT4 by itself. If you told me that "I'm Warren Spector. 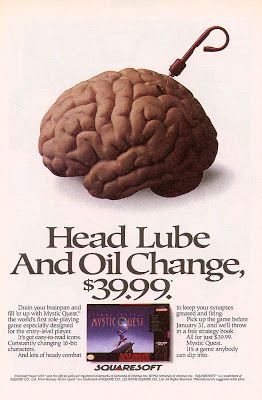 Drink my oil." was a magazine ad campaign from the late 90's, I'd believe you. and it's an ad for Epic Mickey. Can't make out the text at the bottom, but it looks appropriately sexist. Would they have given me orthodontic information as well as sweet graphics info? I find it hard to believe that they're qualified to do either. It looks like it's an ad from 3dfx. I really hope it came out after Sega took them off Dreamcast development and went with a different graphics card company. It makes sense as some bitter kind of "I'm doing great! I never loved you anyway!" breakup letter. 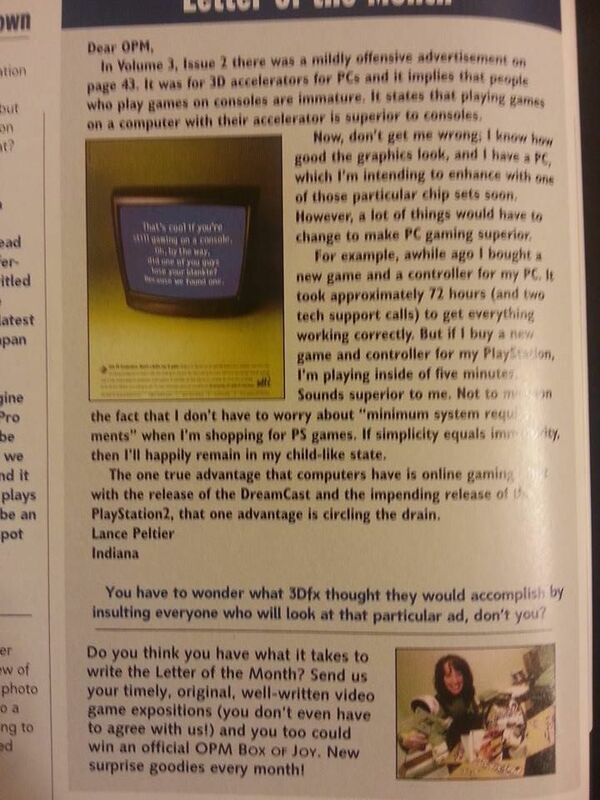 3dfx PC Accelerators. There's a better way to game. Hey, did you guys hear the one about the console gamer and the girl? Neither did we. A little lesson in love, gentlemen: chicks don't dig guys who are behind the times. Sorry. But the good news is, when enhanced with a 3dfx Voodoo graphics accelerator, the performance and visual effects on your PC will kick the snot out of your console. Thus bringing you ahead of the times. So pick one up. Oh, and lose the headgear They hate that too. For more information, check out www.3dfx.com. So powerful, it's kind of ridiculous. In my head, I've always heard woof like goof, but apparently I'm wrong according to pronunciation guides. Offensive to console gamers, no mention of sexism, oh man. He's actually writing about a different ad, which I also found the text of on archive. That's cool if still gaming on a console, oh, by the way, did one of you guys lose your blankie? Because we found one. 3dfx PC Accelerators. There's a better way to game. Most of us started out our gaming careers on a console. And that's fine. But things change as we mature. We stop sucking our thumbs. We stop wetting our beds. And when we find out that PC gaming with a 3dfx Voodoo graphics accelerator is far superior to consoles, we stop playing on consoles. So check one out today. As for the bed wetting, we're pulling for you. For more information, check out www.3dfx.com. So powerful, it's kind of ridiculous. 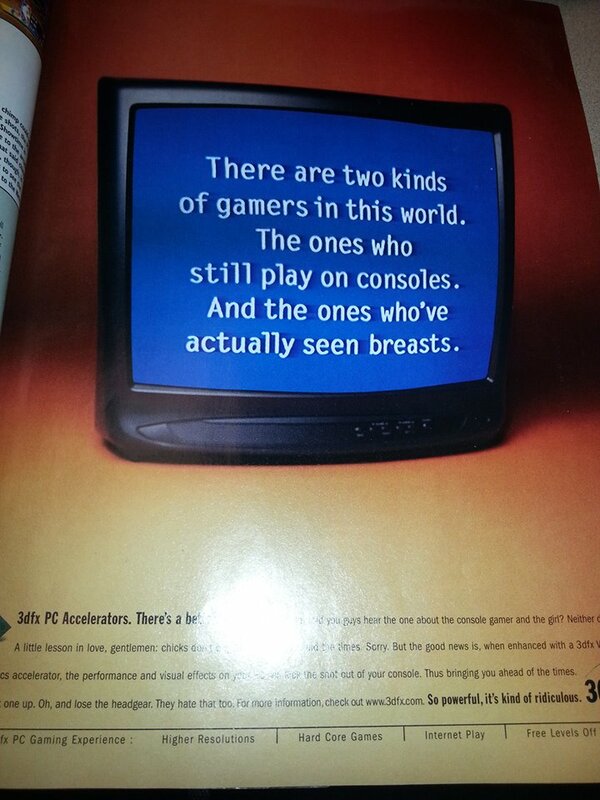 The ad is from very late '99, so after the Dreamcast was released. 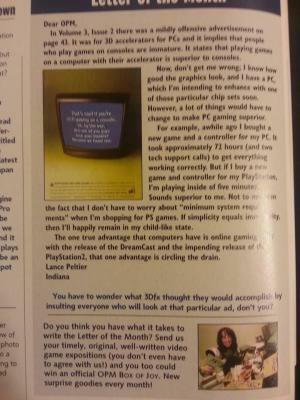 Also worth noting, those ads ran in the Official Playstation Magazine. So, yeah, super insulting ads TARGETED at the people they were insulting. Its a whole ad campaign of horribleness, nice. I had never seen that. Apparently they originally tried targeting an older audience, and when that failed....well, they went a different direction. Oh man I have years and years of old Computer Games Strategy Plus that I know the exact location of. I wonder what kind of gross garbage is in there. It's weird to me how much this looks like a Jeopardy! clue.